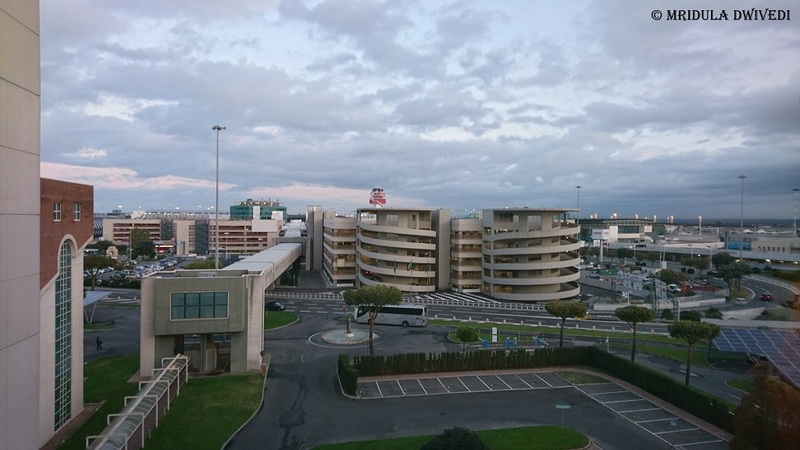 I booked Hilton Rome Airport Hotel for the simple reason that there is only one hotel which is directly accessible from Leonardo da Vinci Fiumicino Airport in Rome. It was my first trip with my sister as adults, so I was doing things properly. 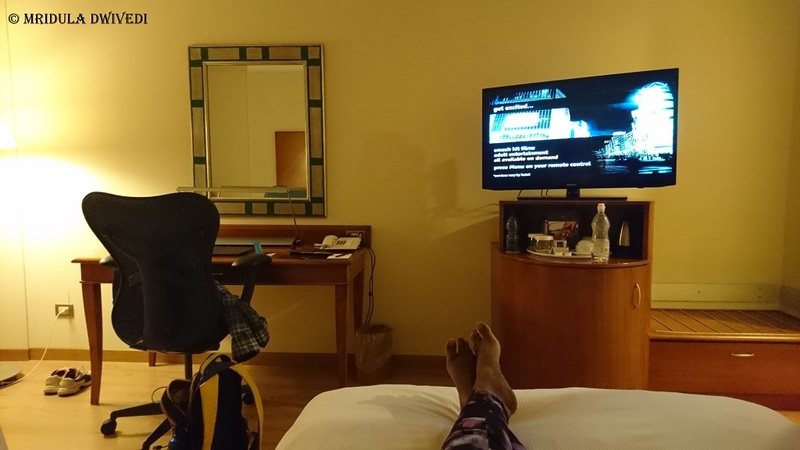 When we eventually reached the hotel, my sister remarked, “It is my first stay in a five star hotel!” And it dawned upon me that it was the first time I booked a five star hotel! I have stayed in many five star hotels because of blogging but this is the only time I booked one. Four star hotels are preferred by me for family vacations as I like to save money! If there was another airport hotel that I could have walked to at Rome in a lower category I would have booked it. But I had no choice and Hilton Rome Airport Hotel it was! I have practically no sense of direction! My joy knew no bounds when I realized that the mobile data I bought in Budapest (Vodafone) worked on roaming in Rome too. Walking to the hotel should have been easy with Google Maps. But I was wrong. We are not sure why it happened but we ended up walking outside the airport when there is a connecting walkway from inside! Then we were on the wrong side of the road too, following the Google Map directions! I think somewhere we ignored the map and that is how we ended up on the wrong side of the road! It was nighttime too. Soon there was a police car next to us! I was not sure if we were breaking a rule by walking on the wrong side. But given my past experiences I decided to approach the officers in the car. There was a policeman and police woman inside it. I said hello and asked if we were on the right path to Hilton? The lady responded that yes, we could keep walking and it would be on our left! I asked if we could keep waking on the wrong side, and they said it was OK. In the meanwhile there was another police car on the other side which honked to this one. They exchanged a few words of which I didn’t understand anything. 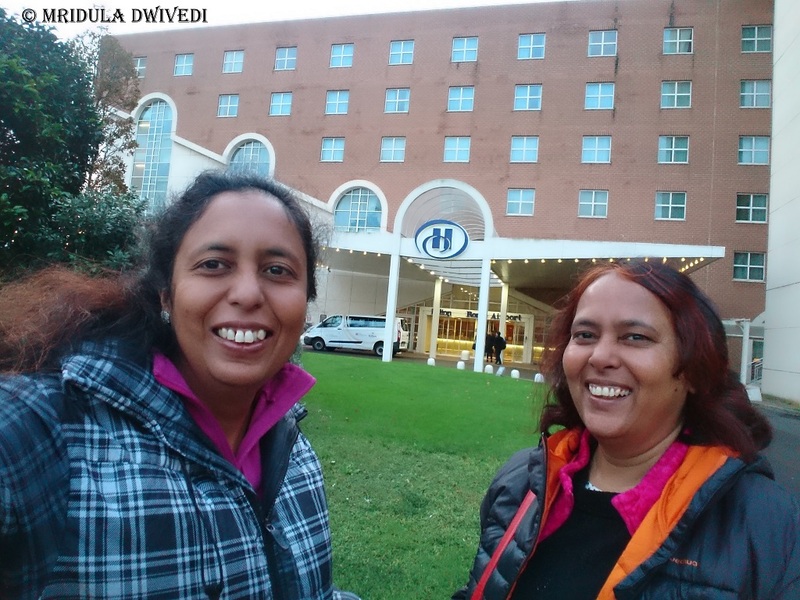 We started walking again and soon we were in front of Hilton! It was a welcome sight. We were still on the wrong side. There was another person a little ahead of us and he crossed the road when there was a gap in the traffic. We Indians are the champions of crossing the rode in middle of the traffic, my sister and I followed shortly. And there we were safe and sound at Hilton Rome Airport Hotel. I think the police car that I asked for directions came to Hilton and waited till we reached there. They drove off when we appeared near the hotel but I can’t be 100% sure. After this, there were no more adventures for us, barring our room door not opening after we came back from dinner. But that was nothing in comparison to finding the hotel! The Hotel is Wheelchair Accessible! Hilton Airport Rome is a busy hotel, many airlines use it for their staff’s layover. We stayed there just for one night as our flight to Delhi was the next day. 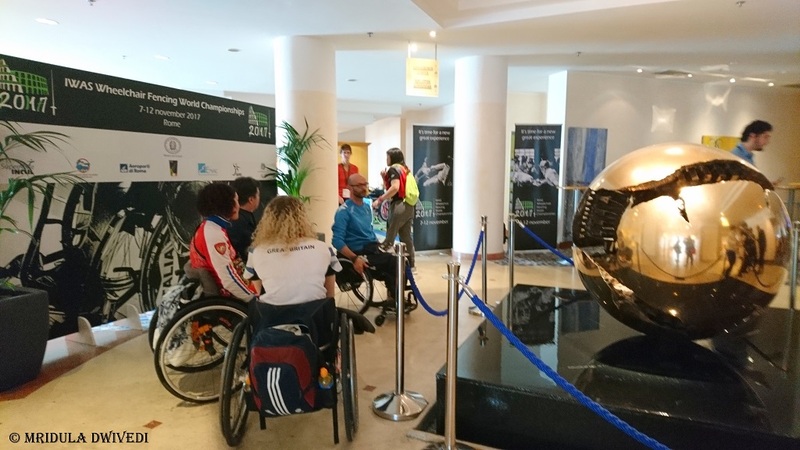 The hotel was hosting participants of 2017 Wheelchair Fencing World Championships. It was a heartening view to see so many wheelchair users in one place. It is the biggest testimony that the hotel is wheelchair friendly! In spite of being busy, when we entered the lobby there was not much of a queue for check-in. The helpful staff at the counter saw through the formalities within no time. He asked if we needed twin beds and I nodded my yes. We were off to our room soon. Our room at Hilton was huge, clean and comfortable! We had a good night’s sleep. The bathroom had a bath tub. It had nice amenities. There was tea maker in the room which we put to good use. I didn’t think much of the view but my sister liked it. The Hotel has heated swimming pool but we had no time to explore it! Other than staying for one night, we hardly used any other facilities. After we came back from our dinner, I could not open the room door, even thought the key access worked. The reception staff was really helpful in resolving our issue. In the end a staff member walked with us to our room and opened the door for us! He could do it without any fuss, making me look silly! When I said so, he was all grace, saying it can happen to anyone! We went to the airport for dinner. 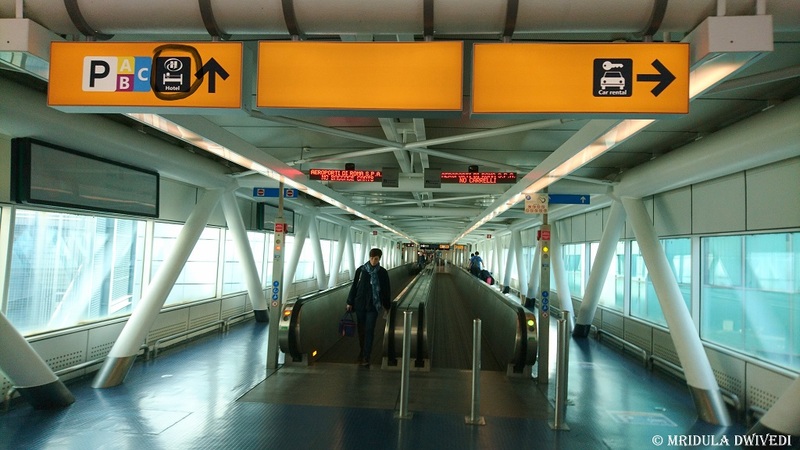 This time I made sure to ask the staff about the direct walkway. There was another Indian guest who was talking to a hotel staff in Hindi! I waited and asked the same staff how could we go back to the airport from the hotel and he showed us the walkway which directly leads you to the airport. So, the hotel is directly approachable from the airport, it was just us who could not find it at the first go. From the airport look for the sign that I have circled. Also the passage goes through parking A,B,C so those signs will also take you on the correct path! 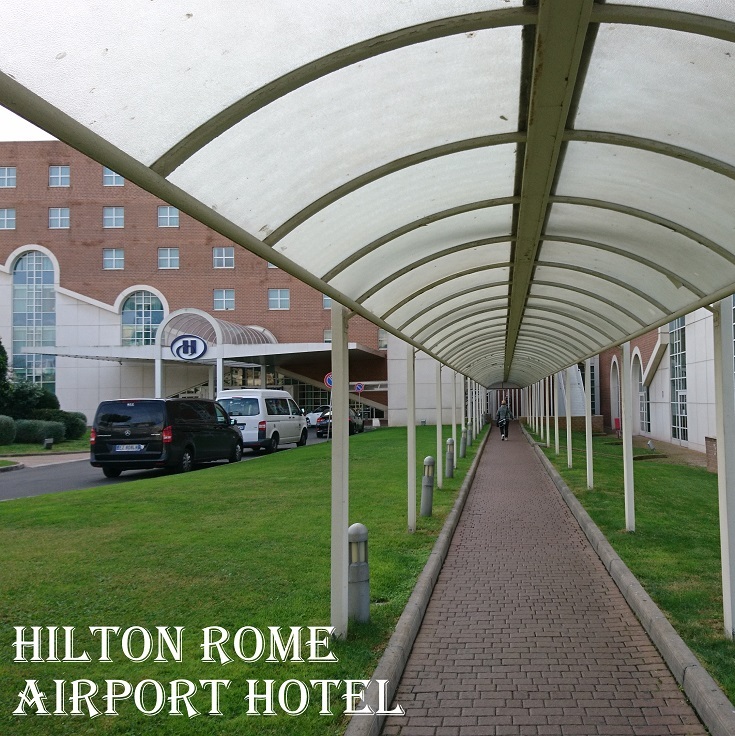 Overall we had a good experience with Hilton Airport Rome Hotel! I would prefer to book a less expensive hotel, but if you are in transit for one night this is a good option. PS. 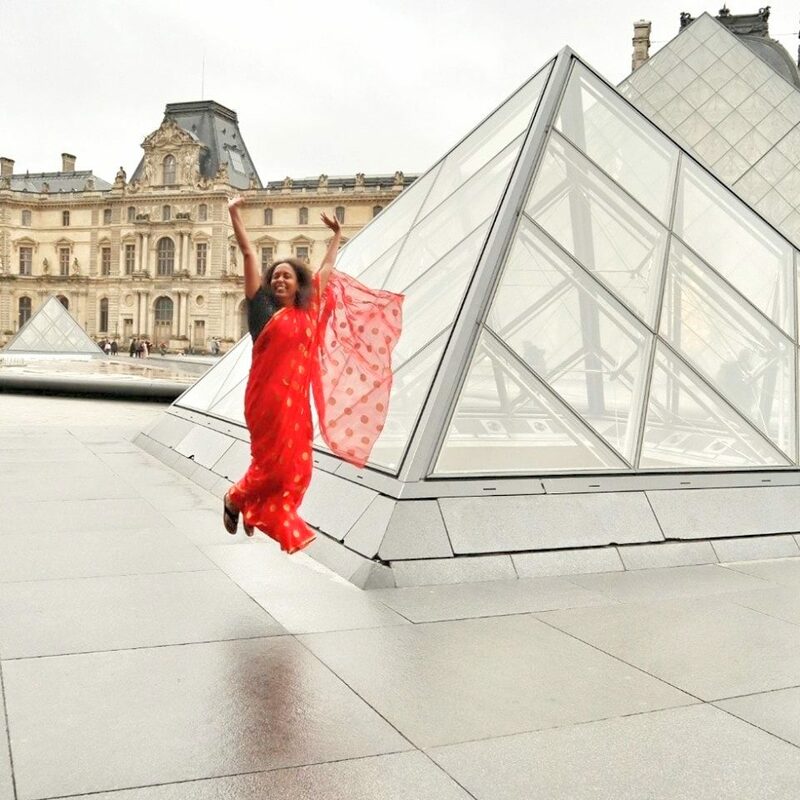 As a blogger I travel a lot on blogging trips. But this was a personal vacation and I paid for my accommodation in full.